This post is sponsored by Grammarly, Inc., but all opinions are my own. One of the greatest drags about writing is all the rules. Unless you are some kind of grammar freak like I am, then you probably seriously hate having to worry about grammar when you write. But did you also know that Grammarly has a useful function as well? In fact, the whole point of Grammarly is to help you improve your grammar no matter the occasion, which is of course, something I can get behind 100 percent (take note, I did not use fictitious percentages like 1000 percent). Each category has specific sub-categories (like under academic you can select essay, case study, and a variety of others). You also get to choose what errors Grammarly looks for. You can choose vocabulary, spelling, grammar, punctuation, style, plagiarism, and sentence structure. After you select your parameters, you insert your text and grade away! Obviously, the yearly plan is the best deal, and you can try it free for 7 days before committing to purchase. I liked the flexibility of different writing styles. Not everything should sound like a graduate paper, which I appreciate about this grammar checker. When I ran a variety of novel passages through the checker (see below), it allowed for a wide range of creative styles. I did like that putting everything through the filter made me more aware of the grammar pitfalls that I fall into a lot, which was an awesome bonus. 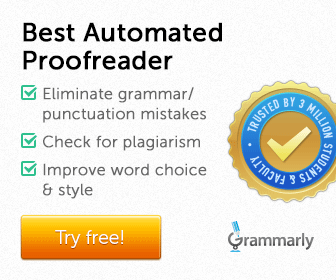 It not only is a grammar checker, but also helps you write better! For the most part, there weren’t any cons about this grammar checker. The only issue I had with it is that the checker really doesn’t like passive sentences or sentences ending with prepositions. Grammarly also objected to split infinitives, and as you know, I tend to love those. None of these “rules” are actually hard and fast grammar rules, but it does help raise awareness to prevent too many instances of weak writing, which I appreciated. Occasionally, the grammar advice was clearly off base. The checker wanted to turn this sentence, “He gently freed his other hand,” into “He gently freed another hand,” which makes no sense. For about 3 weeks, I ran everything I wrote through the appropriate grammar filter. Most of my stuff had a base score of 95 (this post had a base score of 96), which I was pretty happy with. After tweaking, I was able to get most of my stuff to 98 or better. Just for fun, I ran a few passages from famous literature through the grammar checker to see what score they received. I found that switching to the correct grammar checker was important. The Crime and Punishment passage had a score of only 89 when I used the general grammar checker rather than the grammar checker for novels. This post had a score of 88 when graded as a dissertation. Then he was sorry for the great fish that had nothing to eat and his determination to kill him never relaxed in his sorrow for him. How many people will he feed, he thought. but are they worthy to eat him? No, of course not. There is no one worthy of eating him from the manner of his behavior and his great dignity. The Passage: “He went out, trembling all over from a sort of wild hysterical sensation, in which there was an element of insufferable rapture. Yet he was gloomy and terribly tired. His face was twisted as after a fit. His fatigue increased rapidly. Any shock, any irritating sensation stimulated and revived his energies at once, but his strength failed as quickly when the stimulus was removed. Zametov, left alone, sat for a long time in the same place, plunged in thought. Raskolnikov had unwittingly worked a revolution in his brain on a certain point and had made up his mind for him conclusively. This just goes to show you that you can have a wide variety of writing styles and still use proper grammar! I really like the Grammarly grammar checker and it is an incredibly useful tool for any kind of writer. I imagine it would be the most helpful to students. Even if you just try it for a month, I bet your writing will improve dramatically by the end of the month! If this sounds interesting to you, you can try Grammarly free for 7 days! There are so many resources on the internet, it just amazes me! I’m old-school, so I remember having to go to the library to look everything up! I’m going to check this out! That’s a pretty cool service! And I love the ecard haha! I really enjoy following their Facebook page because they posts all sorts of fun grammar-related humor like this. So Cool! I’d probably get lost for hours checking and tweaking posts!